One of my heroes was lost on a mountain in Maine. 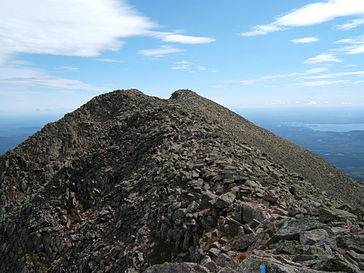 Not on just any mountain, but The Greatest Mountain—Katahdin, it was named of the Abenaki. Highest mountain in the state and sharing with downeast coastal Quoddy Head first light each day in the continental U.S.. The mountain has a distinctive profile, standing lone and long. Its two often cloud-swathed peaks are connected by a narrow path of eroding stone called the Knife Edge, some places 2-3 ft. wide, some places dropping off almost sheer to the valley below. Below the summit of Baxter is a plateau where my hero spent part of his first day wandering in clouds, once dropping through krumholtz. 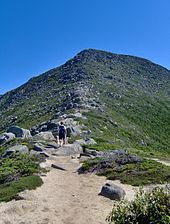 Thoreau, one of the first to write about Katahdin, was guided partway by a native Abenaki and, going on from there, he may have taken the Abol Slide for his climb. We don’t think he made it to the top. The slide has been a well-known hazardous trail for generations. Abol is recently closed to hikers for its accident prone unstable debris, in most places solely an abrupt fall of talus, the unending eating away of rock in numberless pieces by frost-wedging — action begun by the glaciers. That glacial debris is in the Gulf of Maine an eon after these giants left us with nothing but rocks. Rocks. My hero was lost on this mountain, terminus of the Appalachian Trail, in 1939. How can someone be lost on a mountain, you say? There’s only one direction to go — down. After reaching the summit with his companion, he descended to wander through cloud on the plateau below the summit over rocks and stunted mountain trees called krumholtz. 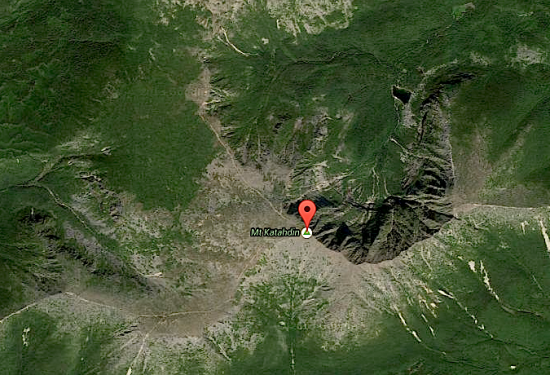 But the surrounding wilderness below Katahdin is where my hero was truly lost, while searchers refused to look anywhere but on the mountain itself. They did not come within ten miles of him afterward, believing him perhaps fallen into a crevice of rock. He had fallen so, in the krumholtz, but managed to climb up and out. Altogether he was lost nine days, and covered perhaps 75 erratic miles. Coming from the suburbs of New York City, he nonetheless had had some youthful training in Boy Scouts, and tried to follow what he had learned with them: follow streams down. He needed fresh water more than anything and thought this plan would keep him from thirst and bring him out to civilization. He was dressed as a day hiker on getting separated from his party in clouds at the summit. To tell you why Donn is my hero would take a catalog of physical, mental, and spiritual difficulties. At the head of the physical list is weakness from hunger. Next, for me, would be biting bugs: relentless blackflies, deer flies, mosquitoes, and another category of blood eaters, leeches, a.k.a. bloodsuckers. Partial nakedness was a difficulty: Before his separation in the clouds he’d kept his jacket but given his sweatshirt to a companion. Donn also lost his dungarees to miscalculation in a leap over one of the numerous gaps caused by glacial erratics in a stream he was following. After slashing his sneakers on talus, he lost them and suffered embedded thorns, deep cuts and swollen feet, stiff toes, and the loss of part of his big toe. I don’t need to add wild animals to the list because these turned out to be a source of comfort to him, even the bears. I think this would not be so today because coyotes now roam in packs through the state, but add rainstorms, fierce sunburn, sickness and vomiting. A catalog of my hero’s difficulties would not be complete without acknowledgement of both psychic and spiritual sufferings. And this is where the real heroic harrowing comes in. He had punctuated the first day with prayer, and ended it with more. (Later he discovered that people across the USA had been praying for him.) On the second day, Donn was afflicted with images of delusion so strong that he was instantly convinced of their reality. He could not understand why people and mechanisms would not respond to him when he tried to communicate or confront them. It wasn’t until his knees, on trying to stand, appeared as metallic mechanisms that his prayers took on a strong character and were no longer simply a matter of habit. His prayers became a potent necessity. Praying worked miracles in his ordeal, but always he felt God encouraging him to get up and keep walking. He had to make choices regarding his route that were beyond his ken. There was the time he decided to forsake an old tote road and telephone line tacked to trees in order to follow the water. Things of human make he came across in this wilderness were moldering and decrepit, camps, bedding, empty tin cans. Sometimes he was forced just to put one foot before the other. Sometimes he was unable to do so and had to crawl. Once he felt strong gentle hands lifting him by the shoulders, setting him on uncertain trembling legs, moving him along just a bit. Sometimes it seemed Someone else was talking to me. They wanted me out of the woods, going home. They would keep me sane if I listened. Another time, near the end, he felt empty blackness come up into his head and mind. To me this blackness seems spiritual in nature but may have been caused by near starvation. Or perhaps it was simply incapacity of a body that could not follow on forever. As noted, the book was first written and published in 1939 after the ordeal, but has since become iconic, and read in the Maine schools. The same first person narrative in other editions of print and audio have followed, with plans to dramatize. The riveting audio book performance is by actor Amon Purinton. He portrayed the experience of Donn’s receiving a bowl of soup, after near starvation in the wilderness as though he were being given a chalice of shed blood just then turned into wine. One thing to add to this catalog of heroic ordeal. 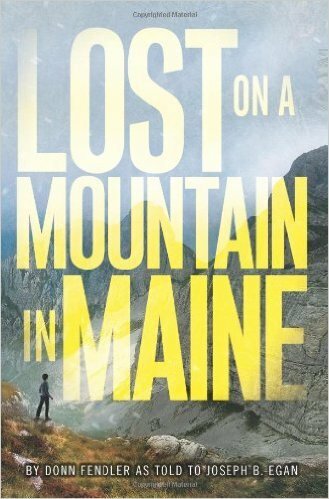 My hero, Donn Fendler, was 12 years old when he was lost on Katahdin in Maine. Lost on a Mountain in Maine. The riveting audio book performance is by child actor Amon Purinton. He made the experience of Donn’s seeing a bowl of soup miraculous.